Bird feeders come in a wide range of sizes, styles, and designs, but the new feeder you choose isn’t always one that will be most attractive to the birds. Knowing how to attract birds to a new feeder will help them transition from one feeder to another so you can add to your backyard buffet in whatever style you choose. Visibility so birds will notice the new feeder and see the available seed. Appropriate feeding ports for seed type and desired bird species. Multiple perches or platforms to accommodate many birds comfortably. Feeder capacity and refill frequency expectations. Pest-resistant features, such as built-in baffles or no-chew construction. Durability and ease of maintenance and cleaning to keep the feeder in top shape. Feeders also come in a wide range of decorative styles, from natural designs to miniature buildings to abstract artistic shapes. Regardless of the type of feeder you choose, it can take time for birds to become accustomed to it and feed willingly. Place the new feeder in the same general area as old feeders. If the feeder needs to be located elsewhere, move it away from the old feeding station gradually, so birds know to follow it. Position the feeder in an attractive, safe location, preferably near a brush pile, hedge, or another type of shelter so birds can feel secure when visiting. Add a nearby birdbath to help birds notice and visit a new feeder, but do not position the bath so close that it will become dirty and clogged with seed debris. A bath with moving water, such as a birdbath fountain, wiggler, or dripper, will be most effective at catching birds' attention. Fill a new feeder with the most popular type of birdseed you offer, even if it will eventually be used for another type of seed or food. Black oil sunflower seeds, sunflower hearts, and Nyjer seed are the most popular and will attract birds more quickly than mixed seeds. Gradually mix in the desired seed to switch the feeder’s composition as the birds get used to it. Spread some seed on the top of the feeder, on a nearby platform, or on the ground near the feeder to draw more attention to the location as a new and valuable feeding spot. Temporarily remove other bird feeders offering similar seed to limit the choices birds have of where to feed. As they become accustomed to the new feeder, other feeders can be returned to duty and birds will use them all. Accessorize the new feeder appropriately with a feeding platform to attract more birds or a squirrel baffle to deter pests and make the feeder more attractive to birds. If you don’t see birds at the new feeder after several days, take careful note of the seed levels to determine if they’re visiting the feeder and you're simply missing them. If the seed is not being eaten, observe your other backyard feeders; it is possible the birds have migrated or are generally visiting the backyard less, and therefore it will take them longer to get used to a new feeder. Also, check the seed quality you are offering in a new feeder. If the seed has not been eaten after several days, it may have become moldy or attracted insects and is thus less suitable for the birds. 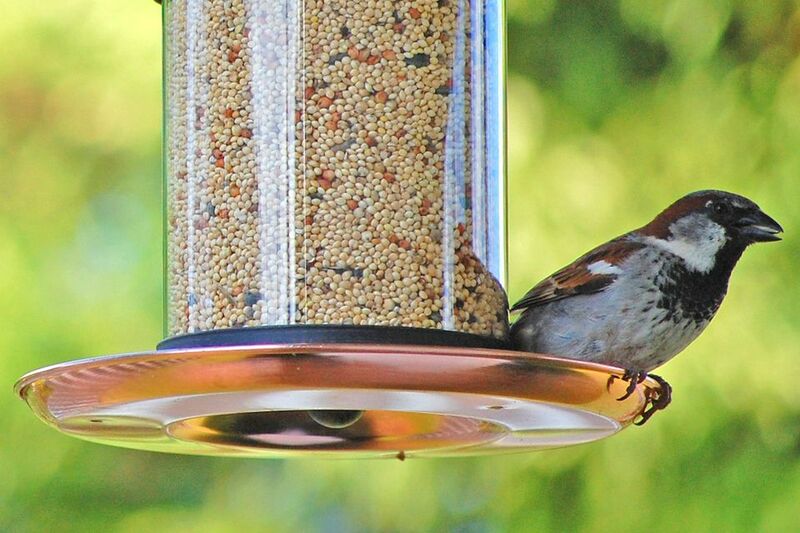 Keep the feeder filled with fresh seed for the best results in attracting birds. At the same time, double check the type of seed offered against the size of the feeding ports to be sure the birds can get to the seed without difficulty. It takes time for birds to become accustomed to a new feeder and to visit it regularly. Patience is essential when using a new bird feeder, but by taking proper steps to make the feeder attractive to the birds, you will soon be refilling it frequently.